Within hours of being at the Washington Hilton, I knew I was in for a special experience. 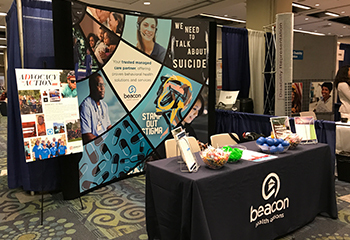 As I began to set up Beacon’s booth at the 2017 National Alliance on Mental Illness (NAMI) Annual Convention (June 28 – July 1), I couldn’t help but notice the hopeful faces all around me. These people are here to bring about change in a big way. As Beacon’s Manager of Creative Services, my team regularly designs materials for conferences and like events, but I never get to experience them in person. This year, I attended to gather a new perspective on the work we do and how it impacts communities nationwide. Through the three days of standing by Beacon’s booth, I realized what an important event this really was. People had come from as far as Hawaii to have their voices heard in our nation’s capital, and I was in the middle of it. I heard from very passionate people, with heartfelt concerns about their loved ones and family members, and the challenges and successes of their ability to access care. I didn’t get to attend the “Hill Day” field trip, where NAMI transported more than 1,000 people from the Hilton to Capitol Hill to meet with their representatives, but I did hear about their experiences. Attendees were fired up about it. It’s rare to have the chance to get in front of your state’s legislators and ask them the hard and important questions about what they can or can’t do that ultimately affects each one of these individual’s lives. It’s this excitement that led me to fully understand why Beacon supports NAMI at both a local and national level. It was clear that all the organizations present shared the same mission: helping people live their lives to the fullest potential. It sounds simple, but harder to achieve than it sounds. One term in particular kept resurfacing: peer support – a term used to describe people who have experienced mental health challenges, whether personally or with family members. In talking with some of Beacon’s peers at the convention Welcome Center, I learned that for many people experiencing a mental health crisis, it’s either go to jail or a psychiatric hospital. There’s no middle ground. If more communities had Community Mental Health Centers and state-funded peer support systems, it would create a safe place for someone to go in a time of crisis, to be with people who understand what might be going on in their lives. Real lived experience at work. Indeed, Beacon has a longstanding peer support program that has been improving lives across the country while also improving outcomes. In talking with some of Beacon’s peers at the convention Welcome Center, I learned that for many people experiencing a mental health crisis, it’s either go to jail or a psychiatric hospital. There’s no middle ground. A program in North Carolina provides another excellent example. Two gentlemen visiting the booth described a program they ran in the Charlotte area, which was a peer lounge within a hospital setting. Here, folks could check themselves in during a time of crisis and meet with onsite peer staff to help them re-enter the world with a fresh perspective. Such a resolution resonated with me, leaving me to ask more questions about how and why this type of environment doesn’t exist everywhere. I know the answers run much deeper than I am privy to, but it seems simple to me. If there are two options for a person in trouble, living with a mental health or substance use disorder, wouldn’t it make sense to create a safe/comfortable place for members to go? Rather than overload jails and hospitals with folks who shouldn’t be there, shouldn’t states take it upon themselves to explore this proven peer-setting approach? It’s important to ask these questions, whether at Hill Day or in a blog. Regardless of the answers, the NAMI convention reconfirmed the important work we do at Beacon, even if that works is creative design. I’ll continue to do everything I can to support my community and our organization as we push forward to find solutions to these very important issues. I think this is a great idea, except for the part about the state funding it. Why is it that every time someone has a good idea, they think the government should do it/pay for it? With government funding comes red tape and bureaucracy. Why not create a national charity with local chapters and fund it privately? Thank you for sharing your experience and insight John! I couldn’t agree more. Thank you for sharing your experience and insight John. I couldn’t agree more. What’s great about John’s observations and perspective is simply this. It does not take a clinician to figure out the therapeutic value that peers bring to the delivery system, merely an open mind. Thanks, John, for raising some really insightful questions about the role of peers in helping people with mental health and substance use issues. Here’s hoping there are answers around the corner!